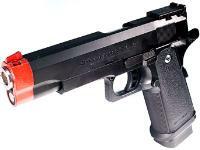 New advanced features include Novak-type sights, skeleton trigger and hammer, ribbed grips, hi-capacity magazine and under rail mount The working safety does not allow the gun to fire unless the grip safety is pressed in, making this pistol very safe and convenient. The beautiful plastic frame, including well-detailed ribbed grips, creates a great look. 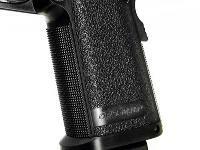 The Hi-Capa 5.1 offers exceptional reliability and performance. The parts fit tight and operate smoothly. 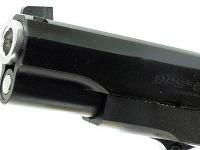 The gas blowback mechanism cycles the gun very quickly and the gun can be fired in quick succession. 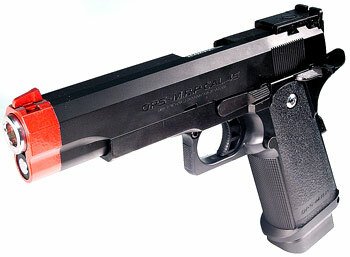 The gas blowback speed & power, hammer operation and other functions of the gun are all some of the best available. 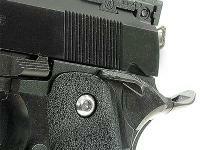 Things I liked: Undoubtedly the best, and most accurate handgun on this page. Tm's are unmatchable in accuracy and reliability. Use Hfc-130 gas, and you'll be tapping people at 100 feet in the head no problem. 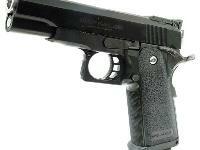 If your in for a gas pistol, BUY THIS ONE. Trust me, you will not be disappointed. Things I would have changed: I wouldn't change a thing about this gun. Buy it, if you want, upgrade it, and you'll be set for a WHILE. What others should know: Make sure you buy a couple extra mags. withs this gun, you'll rip right through em'.